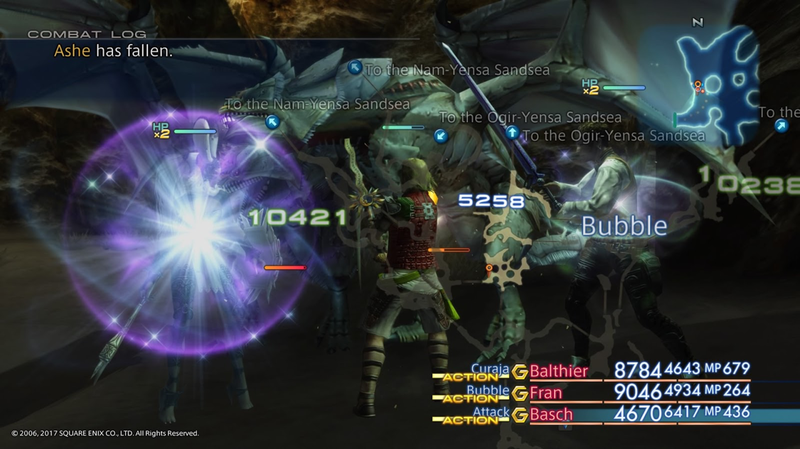 In Final Fantasy XII’s original 2006 PlayStation 2 release, the game’s endearing cast of six party members battled its way through the world of Ivalice using an innovative Gambit battle system that allows players to customize a series of if:then scenarios to fit their play style. In this Gambit system, the player turns over control to the game’s AI, albeit an AI of their own design (see Figure 1). With the 2017 release of the PS4’s HD version of Final Fantasy XII: The Zodiac Age the characters, world, and Gambits are still in place but a gorgeous graphic overhaul overflowing with polished details; stress-inducing, early-game, unchangeable job class decisions that greatly affect later game play; double and quadruple speed options that Stefan Greenfeld-Casas [link] describes; and more, are added. Hitoshi Sakimoto’s score, reorchestrated and re-recorded for this remastered version, plays a more important role in keeping the player engaged than it did in the original. FFXII:ZA teeters in a precarious position of being boring or engaging because of the game’s design and player behavior. 1) Many FF and JRPG fans will inherently “grind” (using repeated battles with easily defeated opponents to level up in order to succeed in side quests outside of the primary storyline). 2) The game’s automated Gambit system requires limited button pressing outside of navigation, which, at certain points, is also unnecessary due to density of enemies as characters will auto-engage. 3) The new turbo speed option of 2x and 4x allow for extremely fast grinding and game progression. 4) Minimap options and HUD character statistics are the only essential visual elements needed to “succeed” in a grind. With these added elements to the re-release, Hitoshi Sakimoto’s score becomes essential to the game’s enjoyment and player engagement because the selectively reduced areas of visual focus and automated, fast-paced grinding renders the graphic enhancements of FFXII:ZA moot. Kate Mancey’s analysis of the innovations of sonic breadth and richness to achieve a more natural synthesis between the live performers and higher-quality samples can be found here. [link] The aural difference in studio quality and advancement is astounding. In this new light, Sakimoto’s cues become more visceral. The Dalmasca Estersands is one of two deserts surrounding the sprawling city of Rabanastre and the first large open area the player can explore and thus do a solid beginning-level grind. Instead of a grand sweeping melodic gesture akin to Maurice Jarre’s Lawrence of Arabia score or a stereotypical usage of Middle eastern scales and instruments, Sakimoto’s cue and orchestration teams with vitality. This is not a dead desert infrequently dotted with oases. Instead it is alive with wolves, cockatrices, dinosaurs, sentient cacti, and evil tomatoes dotting the traversable dunes, wind-eroded canyons, and sand-strewn paths which Sakimoto manages to pack a surplus of orchestrational color into just 99 bars. The unbridled joy and wonder of the cue ties directly to the character, Vaan, and thus the player’s first experience outside of city walls. “Dalmasca Estersands” is Sakimoto’s busiest and most diverse outside of those scored for unplayable cinematics. Soak it in party and gamers; there’s a lot to see and do. Sakimoto’s score informs us there is much to hear as well. The tempo is an unrelenting, brisk QN = 155. Though the unrepeated 9-bar introduction is in common time, the other 90% of the work is in triple meter. This triple meter helps propel the cue and player forward with its strong upbeat-into-downbeat 3|1 (and its variants 3+|1 and +|1) feel. Melodically, Sakimoto encourages this forward propulsion with frequent pickups in the melody or +3+|1 gestures as in the B theme (see below). The introduction features an A Aeolian melody in trumpet with frequent pick-ups into or ties over the next bar. It’s playful, whimsical even with its 3-bar opening phrase and then its 2-bars of 2 different consequent answers. 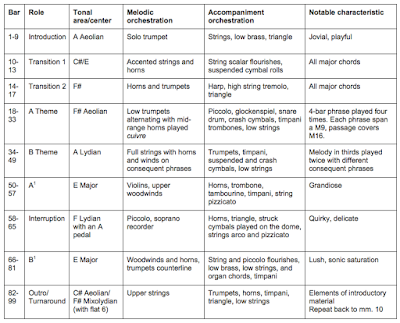 The orchestration, tonality, and meter changes, dramatically shift in the transition to triple meter in C-sharp and with a two-bar sequence upward by minor third, set for low, accented strings and horns. Third and sixth relationships will be common throughout the cue. It is as if the player’s world just grew by leaps and bounds. While continuing this transition for four additional bars, Sakimoto changes the orchestration midway, shifting the string to a high tremolo, with harp and horns left to dominate. This transition sets up an occasionally inflected F-sharp Aeolian of the cue’s A theme. This theme’s range is expansive at a M9, and once completed its four iterations it will have spanned a M16. Adding to the breathlessness and breadth is the first restatement is pitched a M6 lower. This unanticipated wide leap is in character with Sakimoto’s reliance on thirds and breaks with the expected tonic/dominant relations, adding to the overall zealousness of new discovery. The B theme is narrower, with a range of a M6. However, the doubling at the third adds a richness that was absent from the A theme. Whereas the A theme’s upward M9 launch in the span of 2 beats creates forward motion, it is the metric placement of the B theme’s eighth notes that cause the indefatigable propulsion. In “Dalmasca Estersands,” Hitoshi Sakimoto composed music designed to keep the player engaged and moving with a propulsive drive, wide melodic contours, and expertly crafted orchestrational changes within a 99-bar sound cue. 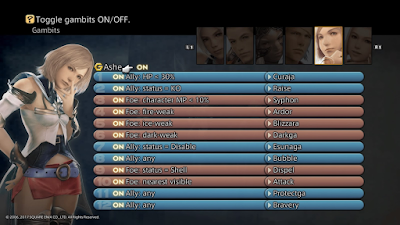 These components capture the thrill of exploring Final Fantasy XII: The Zodiac Age’s diverse world while circumventing the game’s automation. Lee Hartman holds degrees from the University of Missouri-Kansas City (DMA, MM) and the University of Delaware (BM). 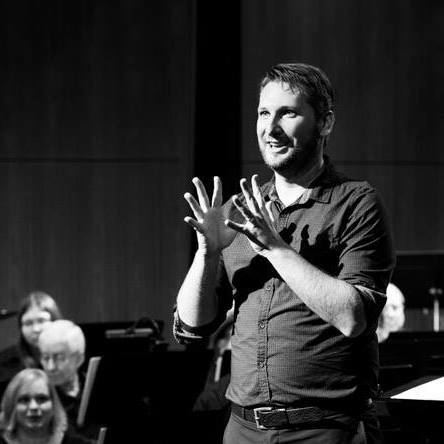 He teaches full time at the University of Central Missouri in the areas of music theory, aural training, and composition and is the recipient of an 2016–17 Excellence in Teaching Award from the College of Arts, Humanities, and Social Sciences. Hartman is the Artistic Director of the Mid America Freedom Band and performs with NorthWinds Symphonic Band. Most recently his compositions have been performed by the International Double Reed Society, New Music Delaware, UCM Wind Ensemble, William Jewell Symphonic Band, Charlotte Pride Band, Norfolk Chamber Music Festival, UCM Flute Ensemble, Midwest Chamber Ensemble, Minnesota Freedom Band, oboist Sheri Mattson, tenor Jake Sentgeorge, and mezzo-soprano Megan Ihnen. A JRGP, or “Japanese Role-Playing Game,” is typically defined by a turn-based battle system of commands (cast a magic spell, attack a designated target, use an item), playable characters are in a party, leveling up, characters have job classes to fulfill a specific role in battle, and a linear plot with optional side quests. Western Role-Playing Games or WRPGs feature many of the same elements however the worlds tend to be more open, encouraging exploration, direct input battles (pull a trigger to shoot a gun, push a button to swing a sword), and a party may or may not be involved. In recent years, the line between the two styles has blurred considerably. See Figure 1. “Foe: nearest visible > Attack” will make the character auto-engage any nearby enemy. For comparison, if memory serves (because PS2 memory cards don’t), it took a little over a month to get to “pre-Bahamut,” the final stage of the 2006 release. The same benchmark has been achieved in the 2017 re-release in just over two-weeks of play time, utilizing the 2x Turbo Mode with a similar playstyle. Heads-up display. FFXII:ZA show information about character current and maximum hit points, status ailments like poison, magic points, and more. A new optional translucent, overlaid world map is also available to player, providing for up to three simultaneous layers of spatial awareness. 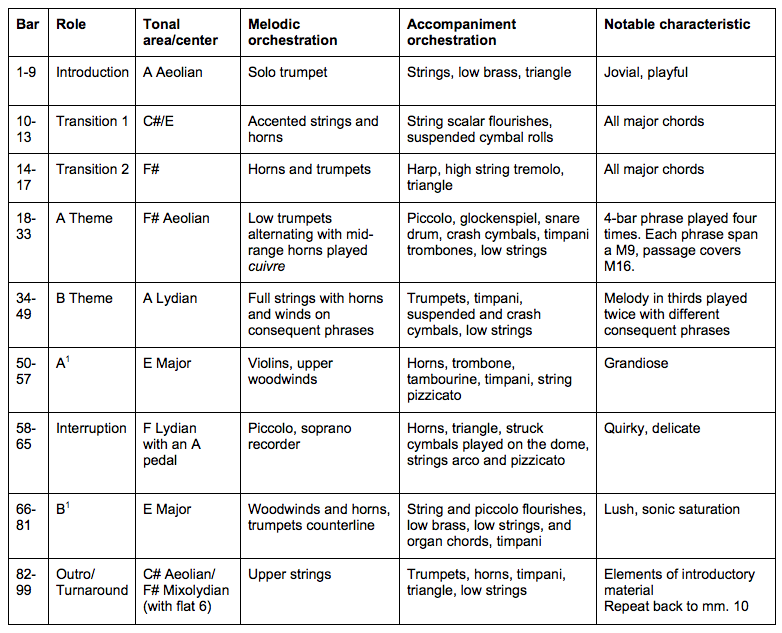 Orchestrational analysis was done by ear and is by no means a complete representation of the full sonorities Sakimoto employs. Instruments included are meant to showcase the dominant sounds and the variety of instrumental color utilized in this short cue.